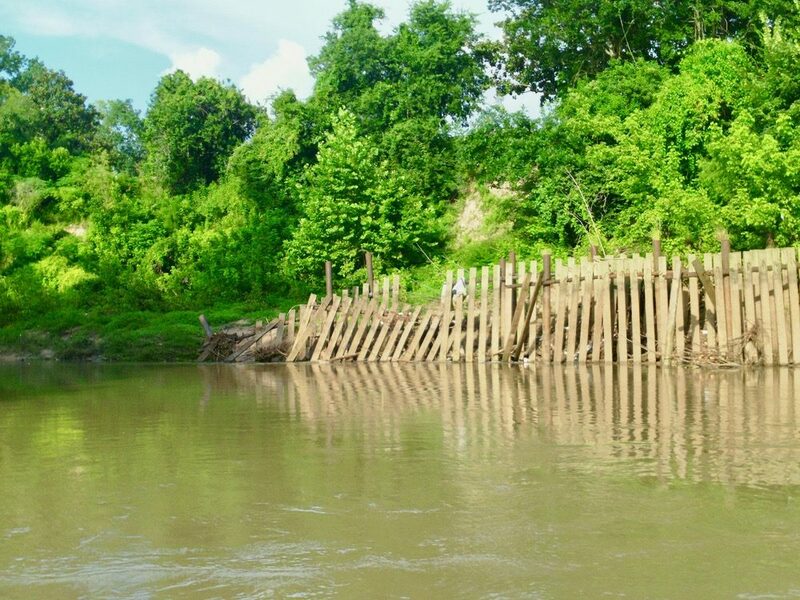 The instability of riverbanks is generally divided into two types: banks that collapse vertically and banks that are worn away laterally or horizontally by the erosive force of the water flowing downstream. 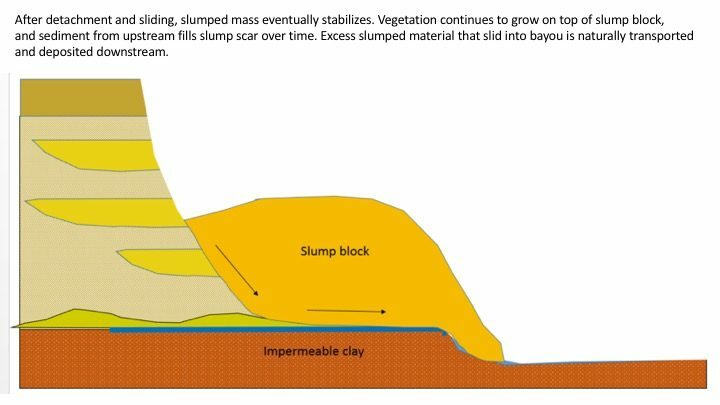 Vertical collapse is called slumping or sloughing. The face of the bank slides or rotates away, often leaving a concave scar or scarp in the bank and a clump of sediment at the base. Sometimes the slump takes trees and vegetation with it. The vegetation can continue to grow in the collapsed sediment, which creates a sort of terrace or beach at the foot of the high bank. 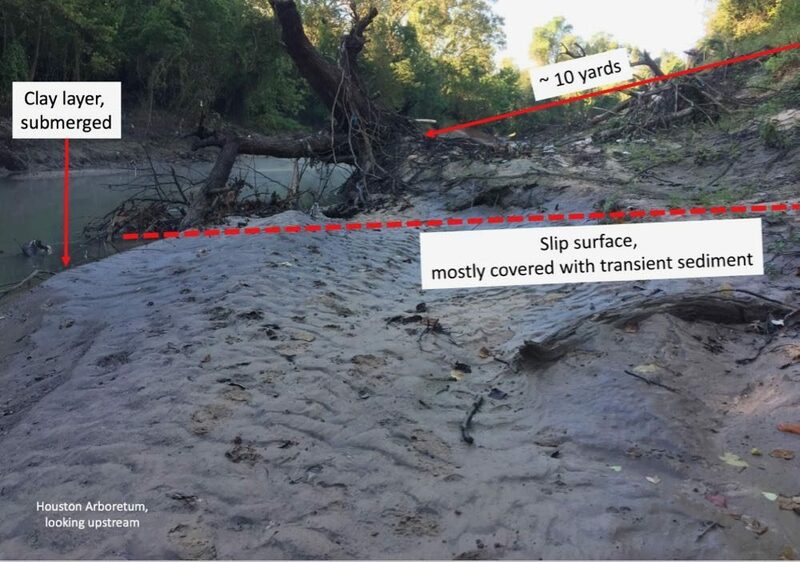 According to a lengthy analysis by geologists working with Save Buffalo Bayou, slumping is the primary type of bank collapse on Buffalo Bayou in the stretch targeted for a $12 million “stabilization” and “restoration” project by the Harris County Flood Control District. This steep, high bank in Memorial Park slumped after the Memorial Day 2015 storm, taking plants and bushes with it. Photo by Susan Chadwick looking upstream on April 10, 2017. But the engineering consultant working for the flood control district describes what is happening to the high banks of the bayou in the project area as “shear stress,” which is the lateral or parallel drag of the water flowing past the banks and down the channel. The district’s permit application to the Corps of Engineers repeatedly refers to shear stress and shear stress only, specifically ruling out vertical instability. (“Vertical stability not an issue.” P. 39.) The Corps’ Environmental Assessment, released in May in conjunction with the granting of a permit for the project, also refers exclusively to shear stress. 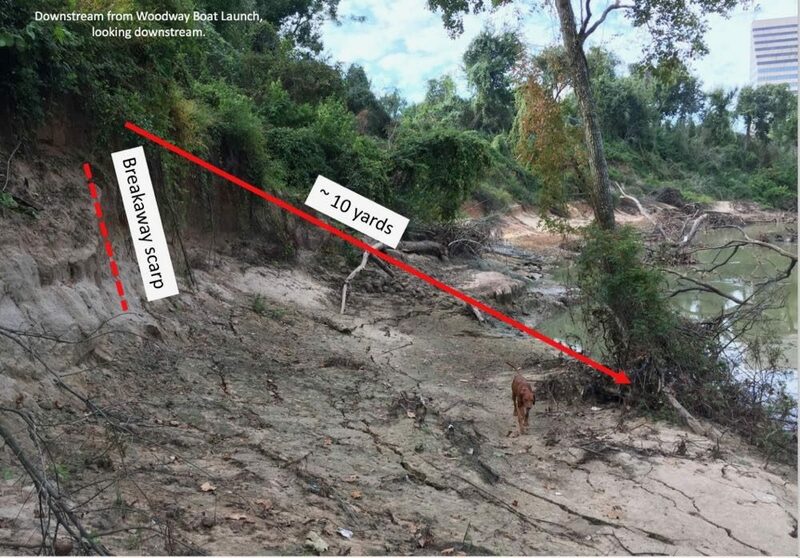 “The assessments conducted by HCFCD’s design team indicated that due to the erosive nature of high flows in the bayou … hydraulic energy dissipation measures (bankfull benches, pool and riffle reestablishment, channel pattern adjustments, and in-stream structures) were necessary in the design to relieve shear stress on the streambanks of the bayou, and ultimately stabilize the channel system,” stated the Corps on page 21 of the Environmental Assessment. 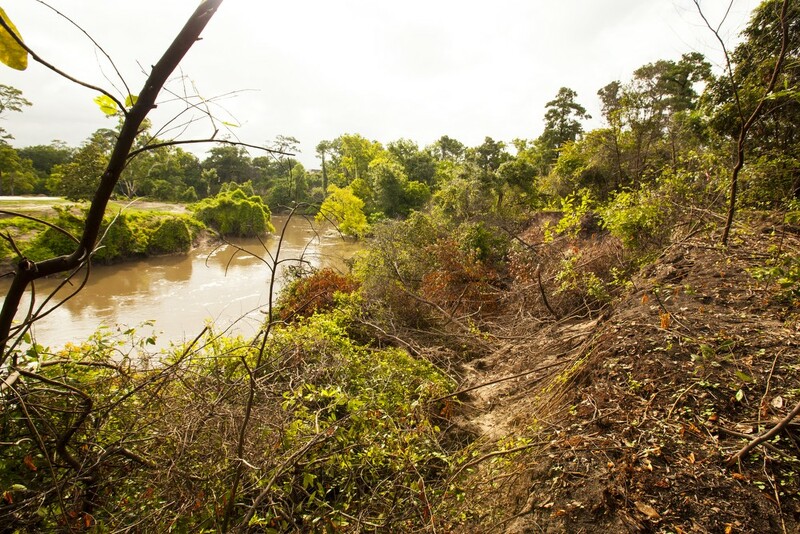 The Corps’ Environmental Assessment found that the proposed project, which would use heavy equipment to raze most of the trees and vegetation and dredge, fill, reroute, and reconfigure the channel, historic high banks and meanders of more than a mile of forested Buffalo Bayou flowing past Memorial Park, would have no significant impact on the environment. But Flood Control’s project, known as the Memorial Park Demonstration Project, is based on an error. 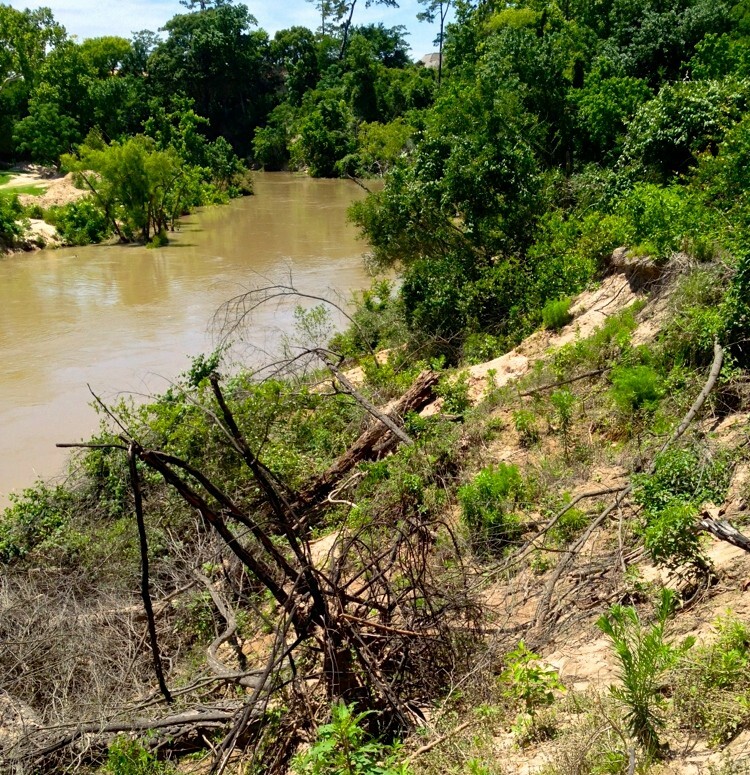 Shear stress—lateral erosion—isn’t the primary problem in this stretch of Buffalo Bayou. 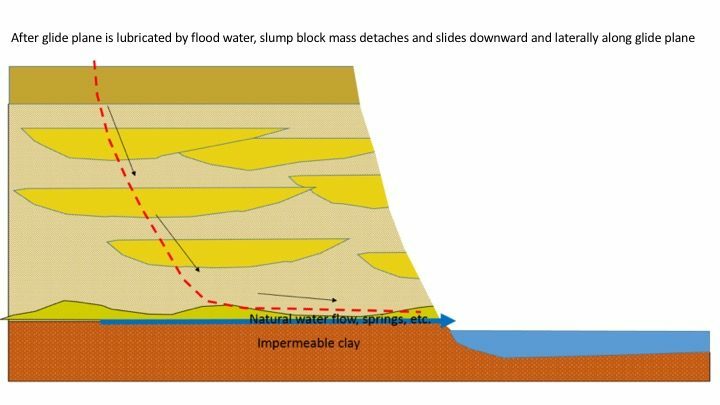 Slumping—vertical instability—is what naturally happens on our 18,000-year-old bayou. (And it’s only a “problem” if you, say, unwisely took down the trees and built your house or your mowed golf course on or near the edge of a bank.) The project will do nothing for slumping, for which there is little remedy anyway. 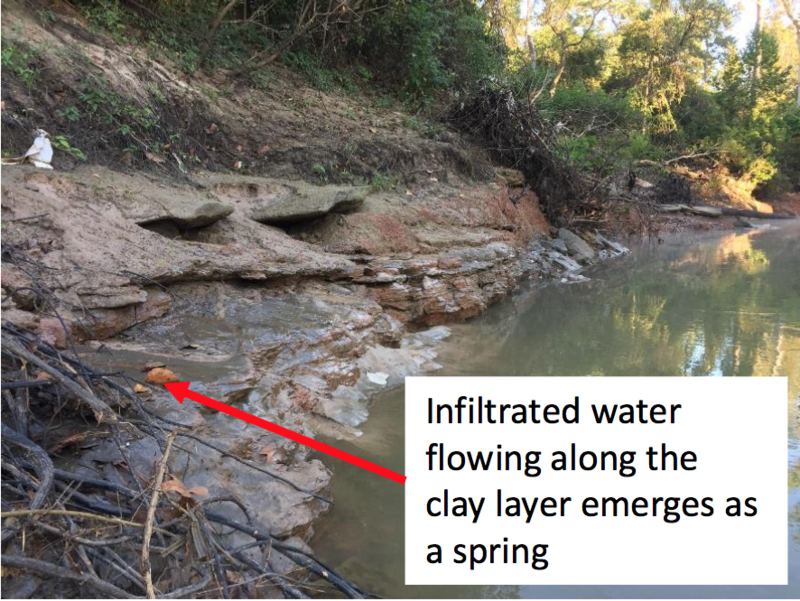 Even worse, the proposed “in-stream structures”—wads of tree roots to be installed to “stabilize” the toe or bottom of the banks to protect them from shear stress—will likely also slide away. 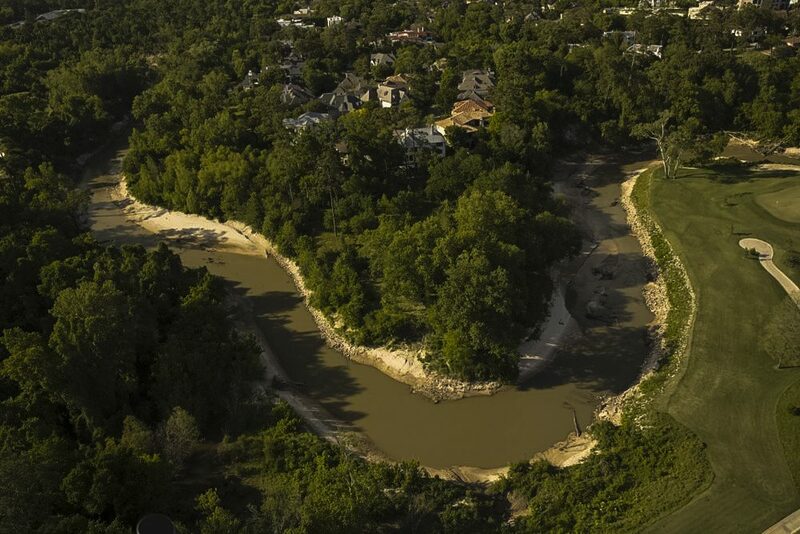 The promoters of the project, who include the Bayou Preservation Association and the Memorial Park Conservancy, decided years ago to use Natural Channel Design to “fix” the bayou and demonstrate what they believed to be a superior method of erosion control. The remedy was decided before the engineering consultant, Kellogg Brown and Root (KBR), or apparently anyone else, had done an analysis of the problem. Except that the same engineering firm, or its predecessor, Brown and Root (BR), had done a study in 1995, almost twenty years earlier. That study came to somewhat different conclusions: vertical stability was an issue. 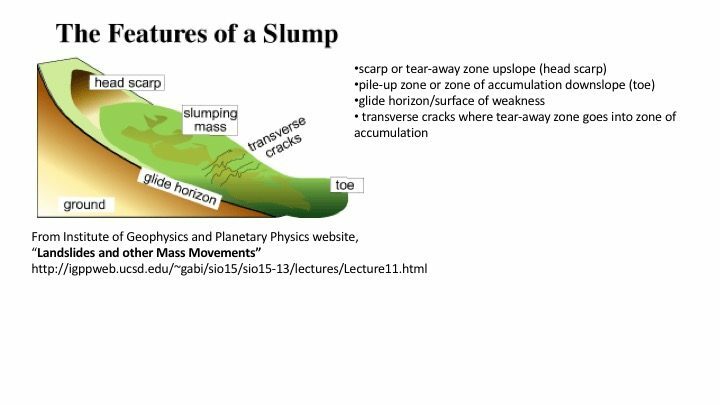 Slumping is different from erosion or shear stress, although slumping is frequently mistaken for erosion. 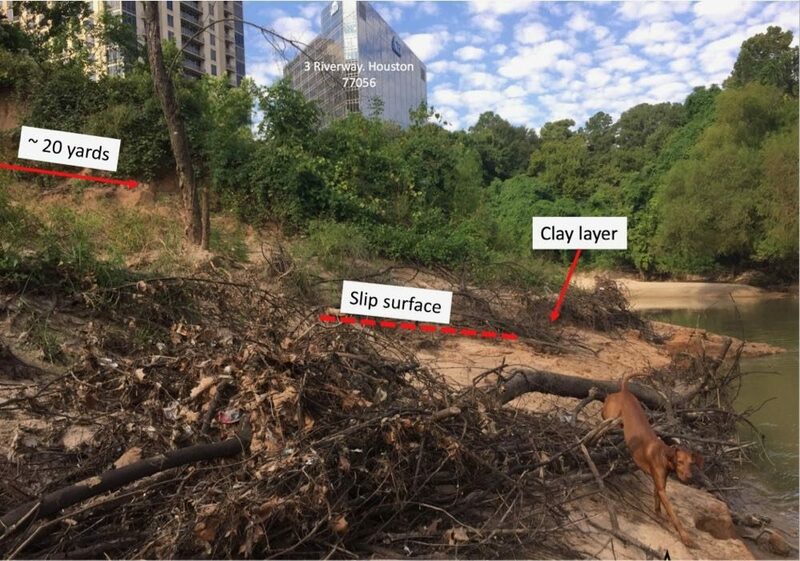 Watch this slide show created by geologist Bill Heins explaining and documenting rotational slumping on Buffalo Bayou. 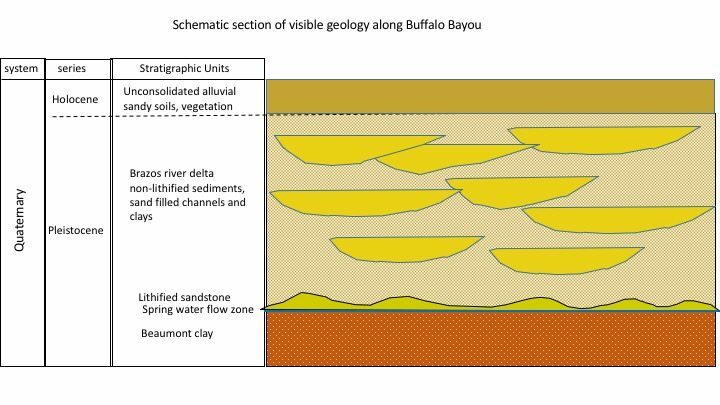 This graphic of saturation and the geology of Buffalo Bayou was adapted by geologist Bill Heins from the Harris County Flood Control District's own imagery in its 2014 permit application, p. 599. 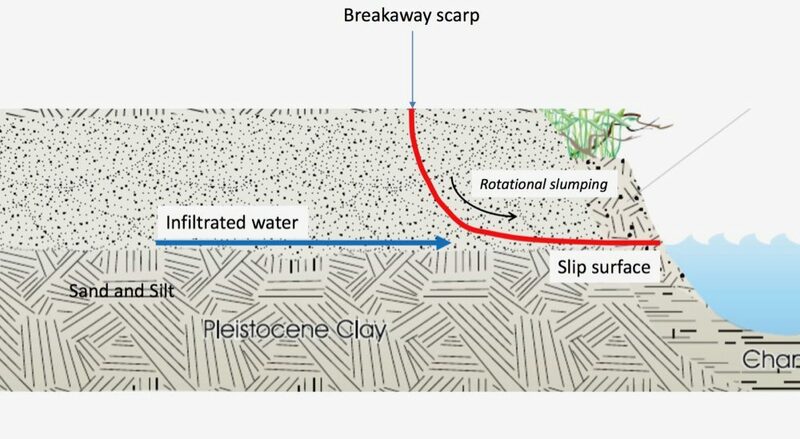 Detailed cross section of a breakaway scarp. 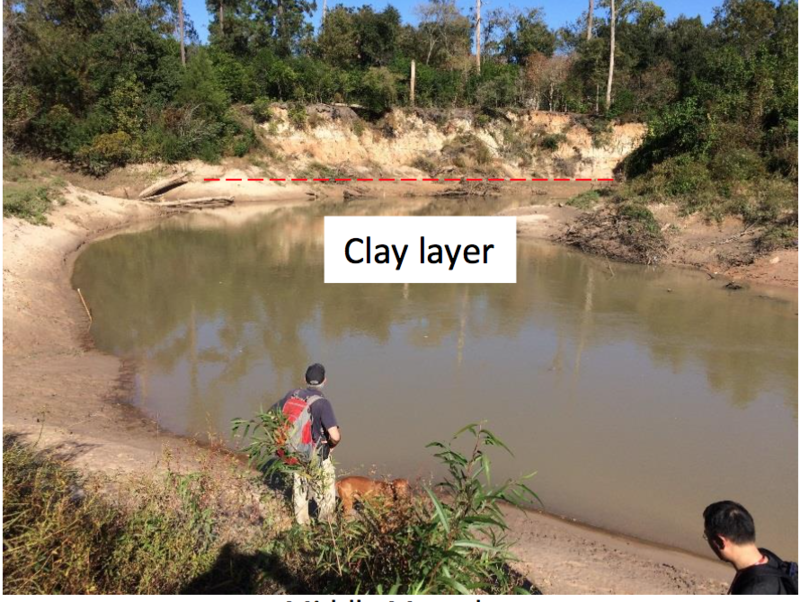 A typical outcrop of the clay layer (slip surface) on Buffalo Bayou. Photo taken looking upstream below the Memorial Park boat launch on Woodway with Memorial Park on the right. All photos by Bill Heins. Downstream from the Woodway boat launch in Memorial Park, looking downstream with Memorial Park on the left. Downstream from the Loop 610 Bridge, looking downstream with Memorial Park on the left. Typical slumping behavior. Private property upstream from the project area. A typical breakaway scarp. Photo taken below Pine Hill Lane opposite Memorial Park and upstream of the project area. Typical slumping behavior. Photo taken in the Houston Arboretum looking upstream. Looking downstream in the MPDP project area, Memorial Park on the left. Standing in Memorial Park looking downstream at the middle meander to be filled by the "repair" project, the ancient high bank obliterated. The high bank, an example of slumping, is misidentified by the project engineering consultant as suffering from severe lateral erosion. 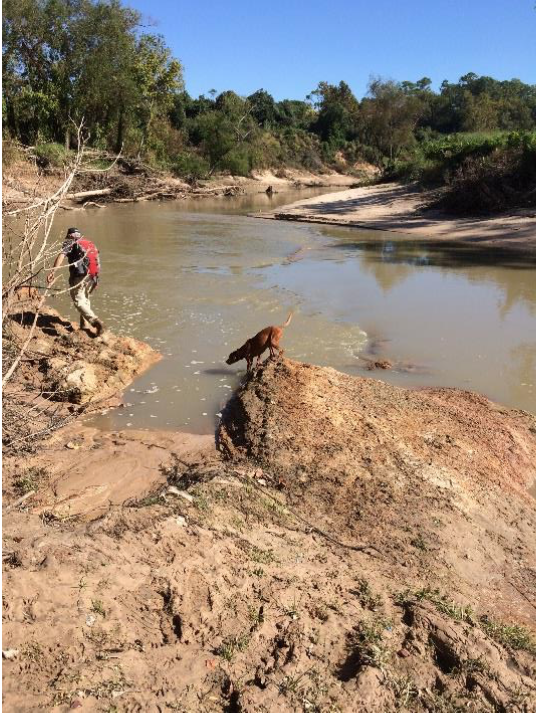 This photograph was taken in the MPDP project area downstream of the middle meander looking downstream below Rains Way. Note riffles in the water that show the hard clay outcrop across entire stream bed. River Oaks Country Club property on the right. 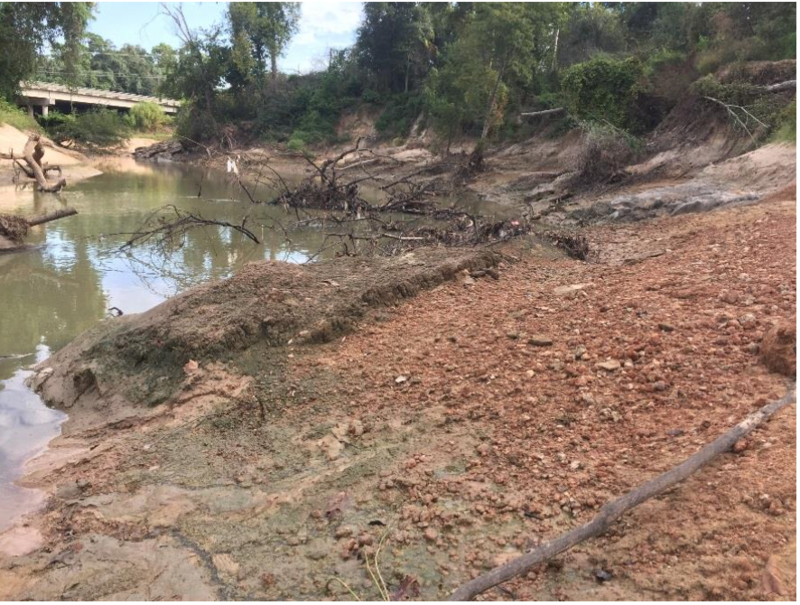 In this type of slumping on Buffalo Bayou, water—mainly from overbank flooding after big storms but also from heavy lawn watering or even heavy rains—seeps from above and saturates the loose, permeable sandy-clay layers below, causing them to become unstable. 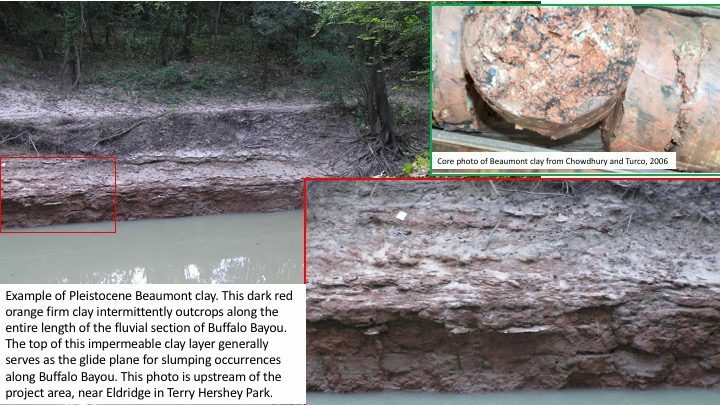 This loose sandy clay sits on top of an impermeable layer of hard, red clay of the very old Beaumont formation. When it hits the hard Beaumont clay, water percolating down from above travels sideways into the bayou, wetting the hard clay. Water running underground laterally (groundwater) on top of the hard clay likewise loosens the unstable sandy clay and makes the hard layer slick. When wet this very old layer of hard clay serves as a glide plane. The mucky, unstable bank loses its footing, slips down, and slides out. This hard Beaumont clay dates from the Pleistocene era of some 250,000 years ago. 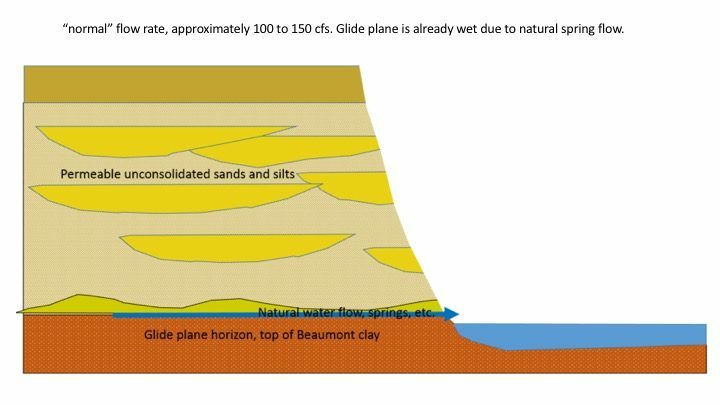 Watch this slide show of graphics and photographs by geologist Tom Helm that also explain this slumping dynamic so prevalent throughout the bayou. Why It Won’t Work. Bayou Been Doing This for Thousands of Years. This project will fail. Grading the banks to a more gradual slope, creating bankfull benches (broad, flat areas beside the stream just above the full bank stage), burying woody debris in the toe of the bank, none of this will work, according to our experts. It will all slide away. Sooner or later. The loose, sloppy-when-wet sediments and the hard, slippery clay layer are deep and extensive throughout the region. The face of the bank will slip off, rotate away, no matter what sort of material is placed on top or dug into the bank. 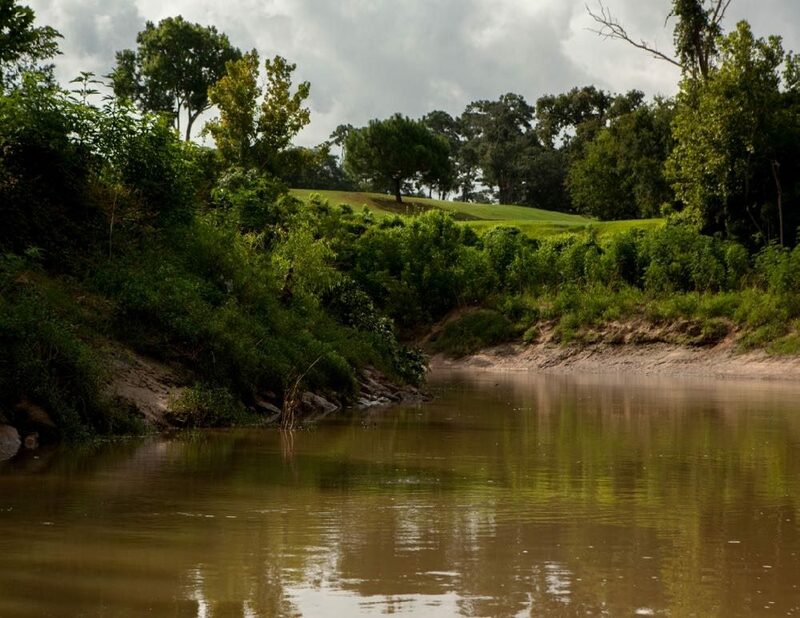 It is the nature of the bayou, the reason why our high banks look the way they do. The living river will do what it wants to do. 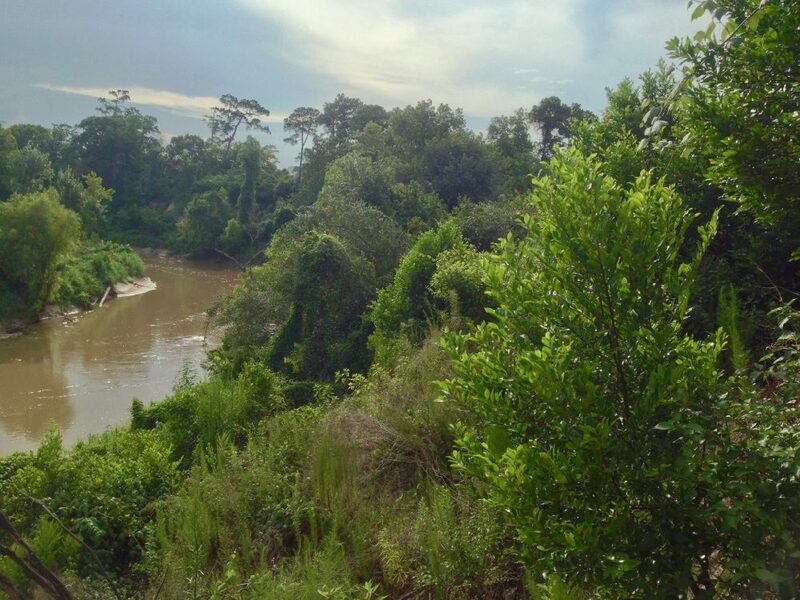 It will steepen its banks again, as it is doing downstream in Buffalo Bayou Park following Flood Control’s Natural Stable Channel Design project there. It will attempt to recover its natural meanders, as it is doing in that park and Terry Hershey Park upstream. Oddly, part of the rationale behind Natural Channel Design is helping the river be what it wants to be. There is simply no remedy for slumping here or elsewhere—other than to move back and out of the way, to not build on top of the bank, to stop watering the grass, to control runoff, to not cut down the trees or put in short-rooted grass at all, and so on. So Why Isn’t the Bayou a Mile Wide? Yet the high bank in the photo above has been standing in place for at least one-hundred years, according to available topographic maps, serving as a solid bumper to the meandering stream at its foot. 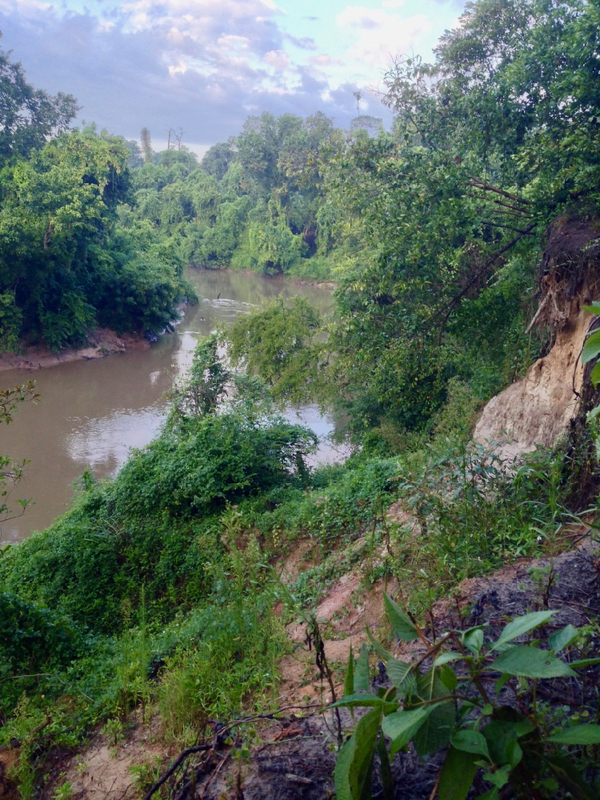 This high bank and meander are one of the four places identified by the district’s permit application as areas damaged by severe lateral erosion. In fact, all four are examples of vertical slumping. The project plan would destroy this ancient bluff, filling in the meander here as well. The fact is that major slumping doesn’t happen all that often. And when it does, the vegetation continues to grow and the banks tend to rebuild. Which is one reason why old slumps are not always so easy to detect. But the slumping dynamic became very apparent following the big Memorial Day storm of 2015. Heavy rains and runoff collected rapidly in large drainage pipes from our paved and built city below the closed dams. The flow in the bayou reached 8,500 cubic feet per second (measured by the Piney Point gauge). Water flowed far over the high banks. 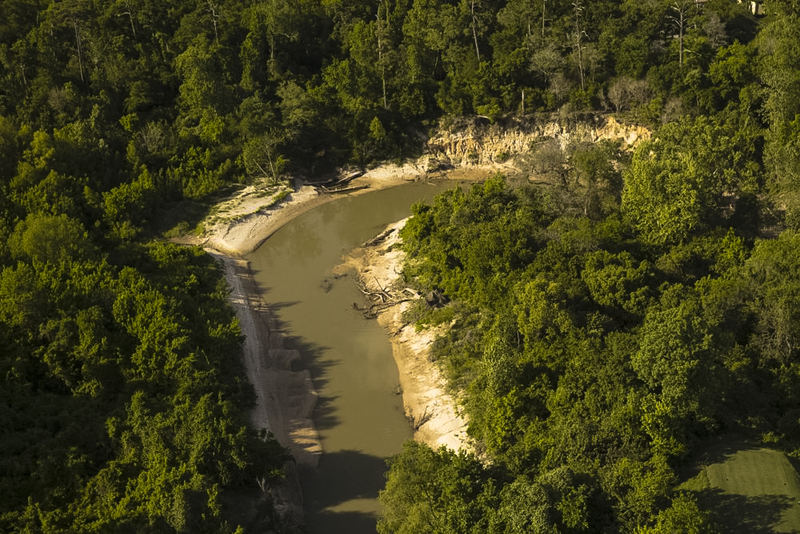 (Base flow in the Buffalo Bayou is about 150 cubic feet per second, and houses begin to flood downstream from the federal dams west of the city when the flow is above 4,000 cfs.) The big Tax Day (April 18) storm of 2016 also reached 7,000 cubic feet per second. That storm was followed by more heavy rains, resulting in high flows over 3,000 cfs for weeks, both from the rains and from urgent releases between storms from the normally-empty reservoirs constructed in the 1940s to protect the city downstream. Extended high flows and heavy rains like that saturate the banks. 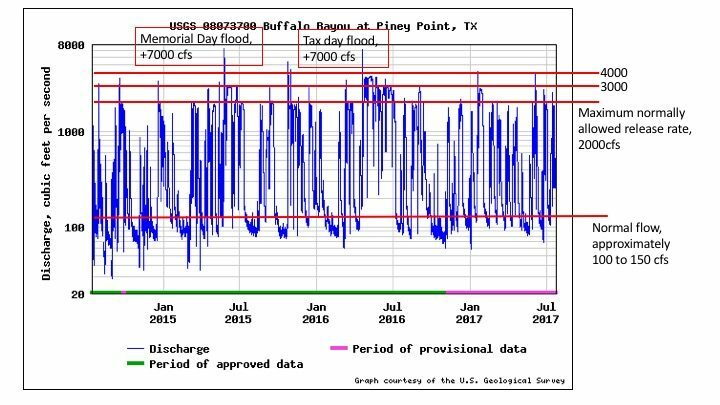 The five to nearly seven inches of rain that fell in a very short time on and around the western part of the county Tuesday, Aug. 8, drove the Piney Point gauge up to 6,000 cfs and caused house flooding in upper Buffalo Bayou. It likely caused some slumping also. One of the features of this type of vertical slumping, as mentioned above, is that the top and face of the bank slides down taking living trees and brush and their clumps of roots with it. The bank sediment generally stays in place at the foot of the bank and the trees and vegetation re-root and continue to grow. The high bluff of the Hogg Bird Sanctuary at the downstream limit of the project area is an example of this. It is another of the four places identified by the district’s consultant as suffering from severe (lateral) erosion. It too is an excellent example of (vertical) slumping and rebuilding. Here is a slide show of the south-facing Hogg Bluff that slumped after the Memorial Day 2015 storm and subsequently restored itself. Notice the vegetation that glided intact from the top and remained at the foot of the bank, collecting sediment, helping to rebuild the bank. 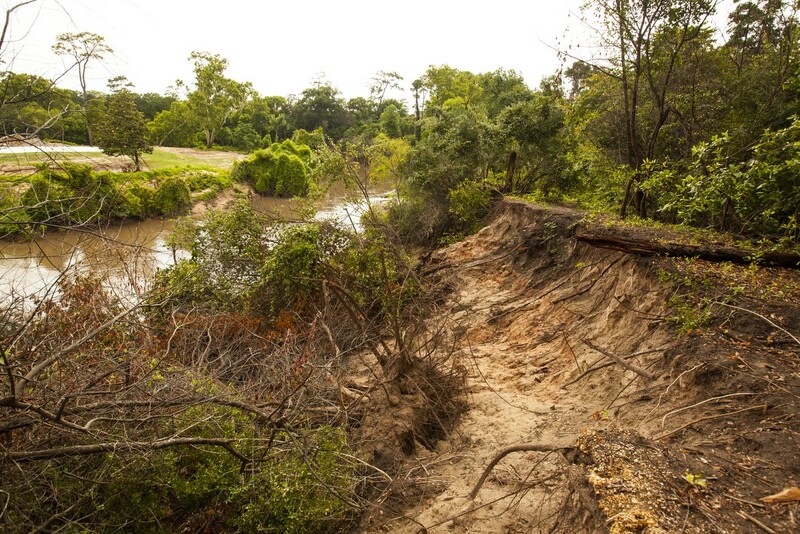 Slumping and downed trees on a high bluff in the Hogg Bird Sanctuary in June 2015 following the Memorial Day flood. Another view of the same bank, same day. May 9, 2016, following the April 18 Tax Day storm, during extended record high water releases from the federal dams. The same high bank three months later on August 4, 2016. The same south-facing high bank nine months later on April 29, 2017, greening with spring growth. South-facing bluff in Hogg Bird Sanctuary on July 11, 2017. Photo by SC. 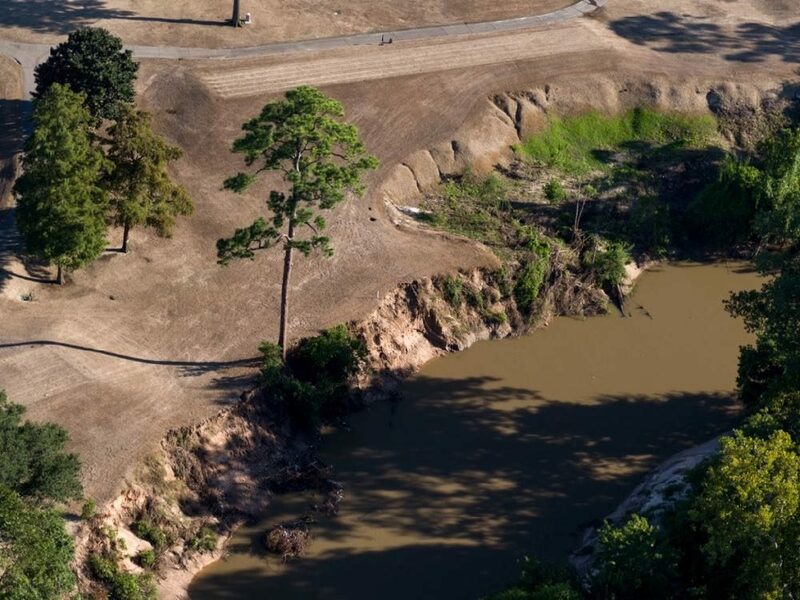 Another area identified by the district’s consultant as an area of severe lateral erosion resulting from shear stress is a high bluff on the south bank of the bayou owned by the River Oaks Country Club. In fact, it also is an example of vertical slumping. This slide show begins with a photo taken in 2014. 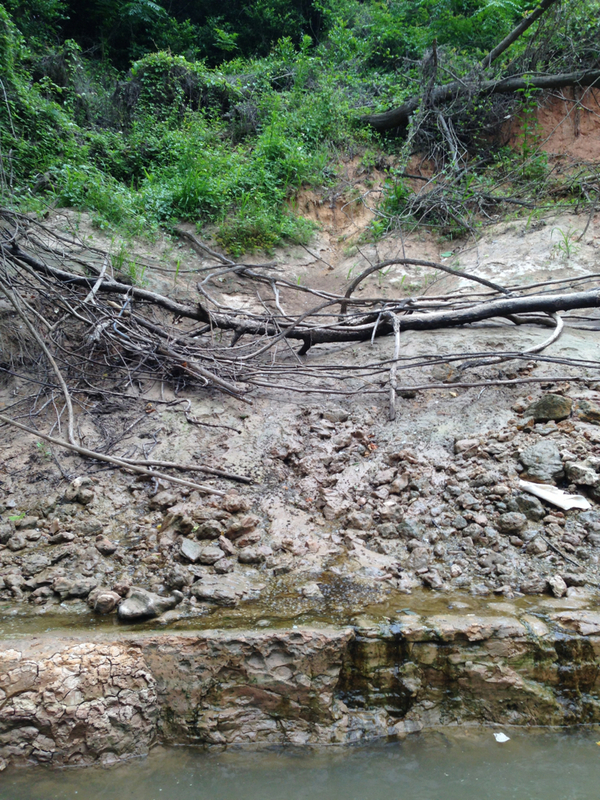 Note the trees and vegetation growing on the stable sediment fallen away from the cliff face. 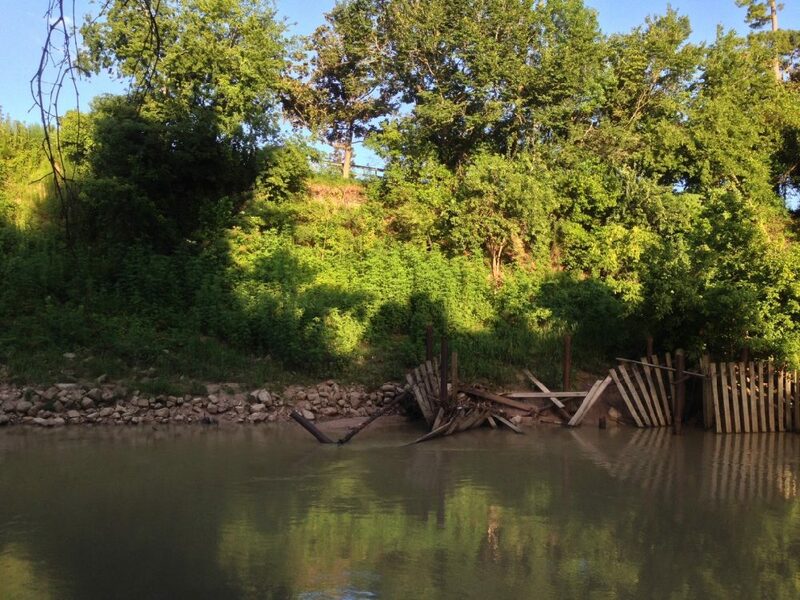 This vertical bank collapse was likely aided by the removal of trees and the watering and mowing of the short-rooted grass up to the edge of the bank, a common cause of river bank slumping in urban areas. In 2015 the club cut down the trees and vegetation growing out of the collapsed material at the bottom of the bank, graded it and covered it all with concrete riprap. The club owns the entire south bank—half the project area—and is a one-third partner in the project with City of Houston and Harris County Flood Control District taxpayers. If the project is to go forward as planned, all three partners (or their representatives) will have to agree to spend at least double the initial $6 million estimate for design and construction. High south bank that slumped years earlier. Trees and vegetation are growing on the terrace established at the base out of slumped material. 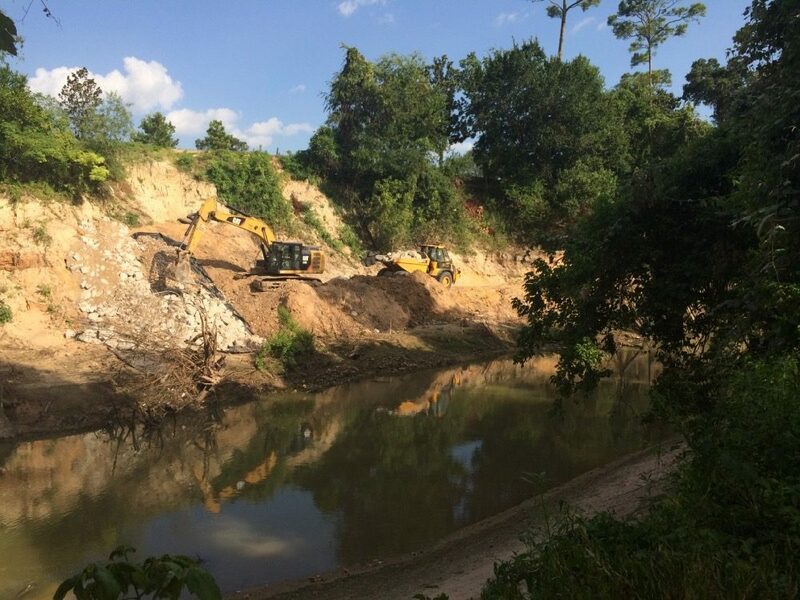 This photo was taken in July 2014 near the upstream boundary of the River Oaks Country Club golf course, which is also the upstream limit of the project area. 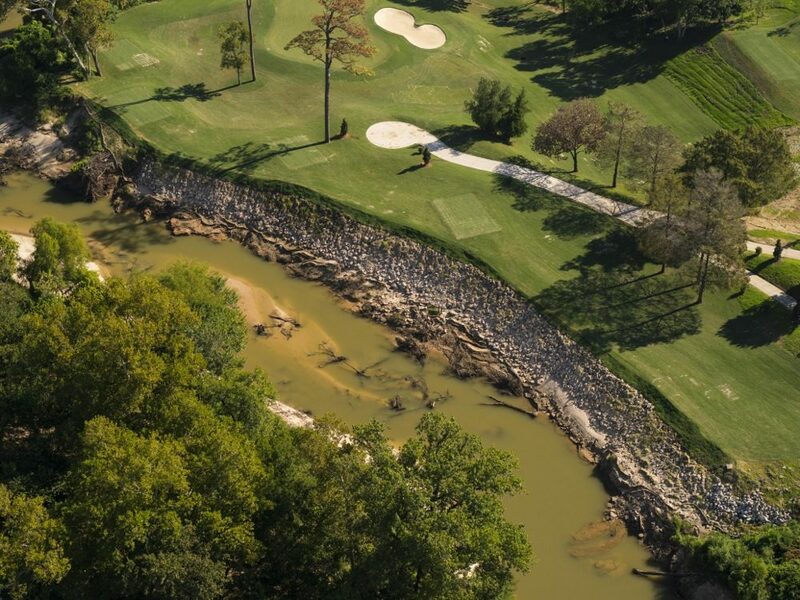 An aerial view taken April 7, 2017, by photographer Jim Olive shows the mowed country club golf course extended up to the edge of the old slumped bank. 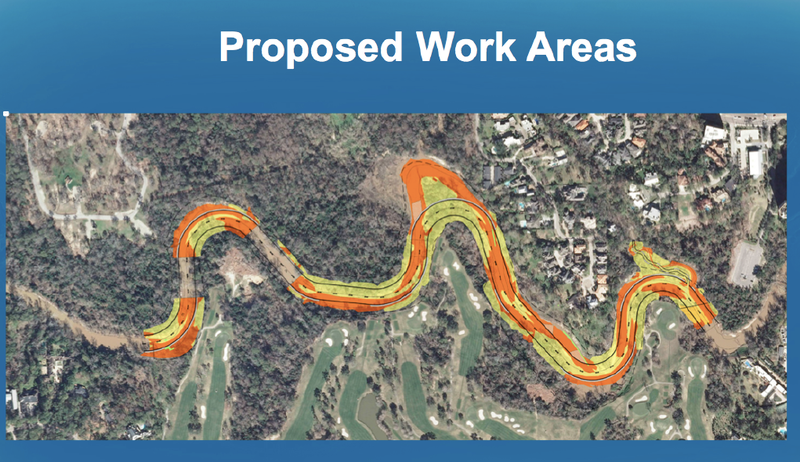 In the proposed plan, the trees and sandy bank on the left, which is Memorial Park, will be dug up and the country club bank on the right, already armored with riprap, will be filled in, moving the channel northwards, shortening the river, and cutting off public land. Neither the riprap nor the toe wood proposed by Flood Control for this bank addresses the causes of this type of vertical bank collapse. 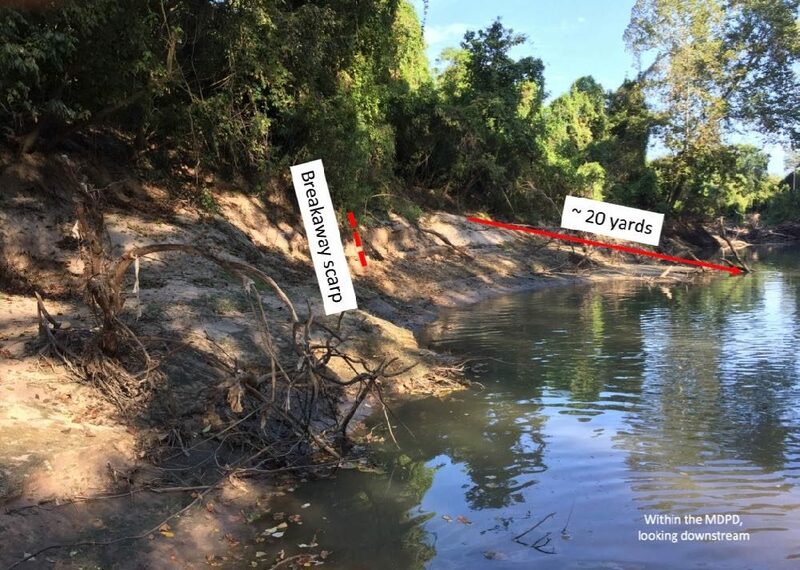 Riprap is specifically rejected by the Corps in its Environmental Assessment of the project “due to: the lack of shear stress reduction, lack of habitat creation, lack of natural occurrence within the project reach, and erosive energy transfer it would place on the opposite bank of the bayou at a downstream location.” (p. 23) The weight of riprap used on a slumping riverbank can actually accelerate slumping. 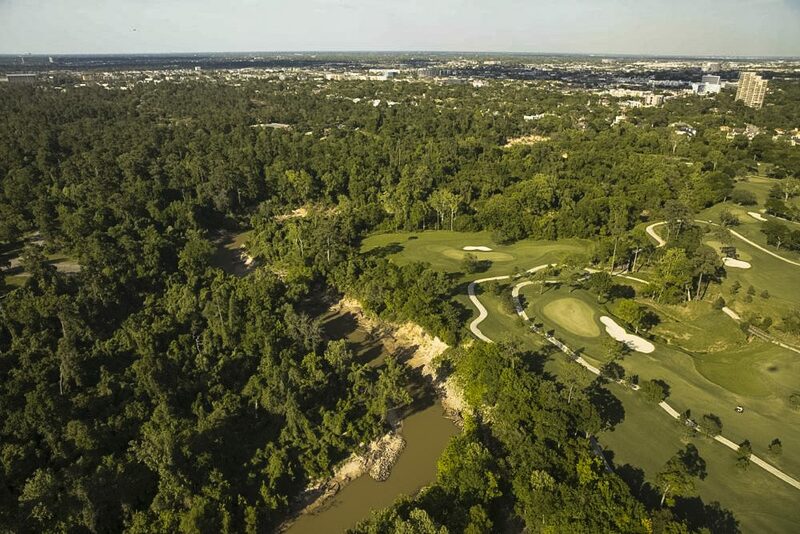 The fourth area of slumping misidentified as severe lateral erosion is also on the country club’s side of the river where the club over the years has cut down the forest and extended the mowed and watered grass of the golf course up to the very edge. This stretch, with wetland springs visibly seeping out of the low bank, was likewise covered with riprap in 2015. 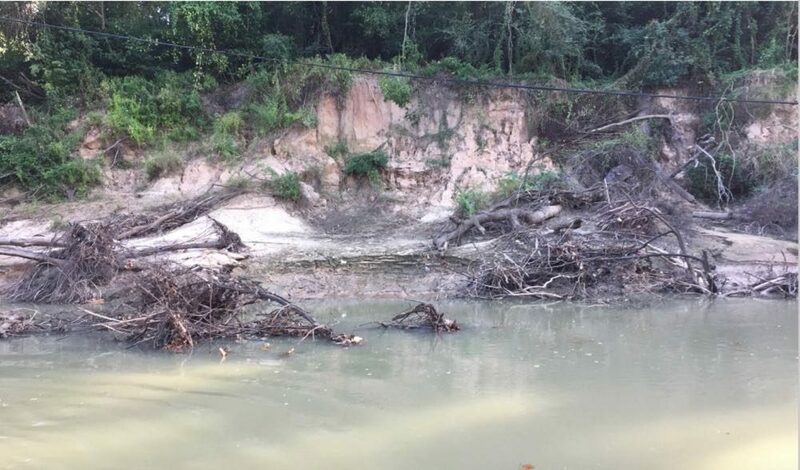 One area of bank instability not mentioned by the district’s consultant in the 2014 permit application was noted in the erosion study done by the same engineering firm in 1995. (See below.) This bank collapse too is an example of slumping. The following series of photos is of the north bank just upstream from the small tributary flowing from the center of the park. (Both the Corps and the district ignore the existence of this perennial stream, referring to it as a gully, if at all. 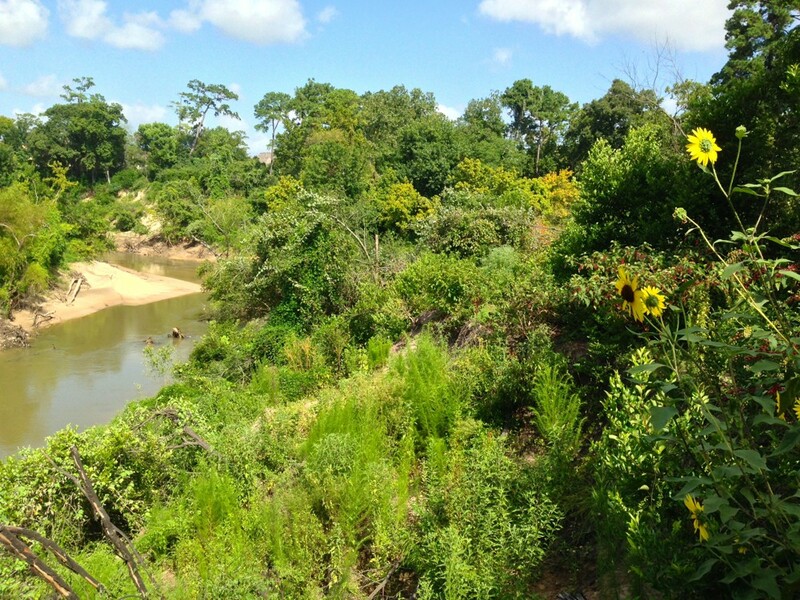 As a tributary of Buffalo Bayou, it should be protected by the Clean Water Act. It will be blocked by the project.) The first photo of this lovely bend in the river was taken by Jim Olive in July of 2016 after the big storms and high waters of 2015-2016. The second is a photo of the same area in July 2017 as it continues to grow. If you stand on this high bank in Memorial Park you can look down on the clumps of trees and vegetation that slipped down during the high waters and are now growing back. This slumped area, now healing, will be pointlessly dug up and reinforced with wads of tree roots at the bottom where the trees and vegetation are growing. Trees on the banks apparently will be cut down for the root wads that contractors will bury in the bank where they cut down the trees and vegetation. And yes, that logic is difficult to follow. This photo was taken at very low base flow by Jim Olive in July 2016 from the north bank in Memorial Park after the big storms and high waters of 2015-2016. Note the slumping on the left bank, the outside bend. Same view of the bend in the river on July 10, 2017. Photo by Jim Olive. Note regrowth of vegetation on slumped bank. We agree that erosion and deposition are natural and necessary functions of a healthy river system. (See also here.) We fundamentally disagree with the current idea that this beautiful living stretch of the river needs to be, can be or should be “fixed.” Dynamic rivers are healthier and more biologically diverse, and better for us. We do also recommend better land management practices and education about them. 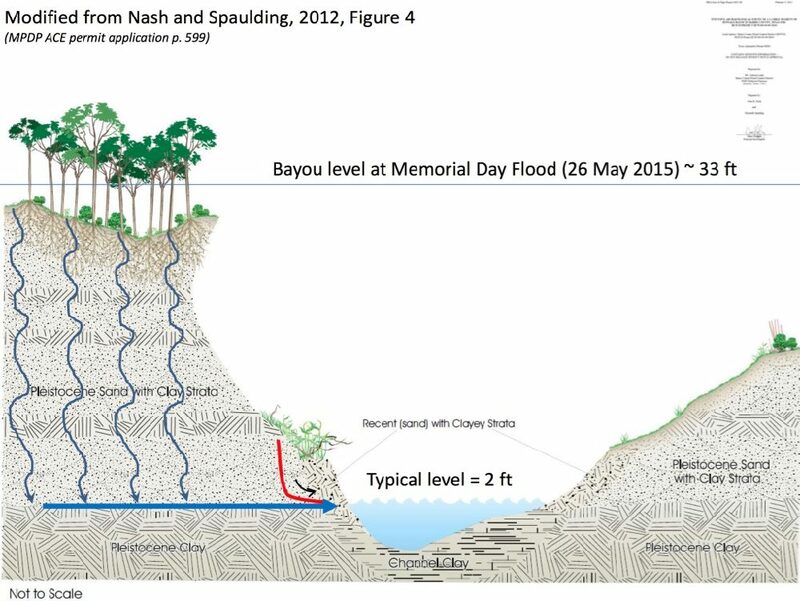 The flood control district, in attempting to justify the project, gives two wildly differing figures for the amount of sediment contributed to the bayou by the banks in this short 1.25-mile or so stretch. It’s both 359 tons a year in the permit application or 5,491 tons a year in the district’s 2014 response to public comments made to the Corps of Engineers. 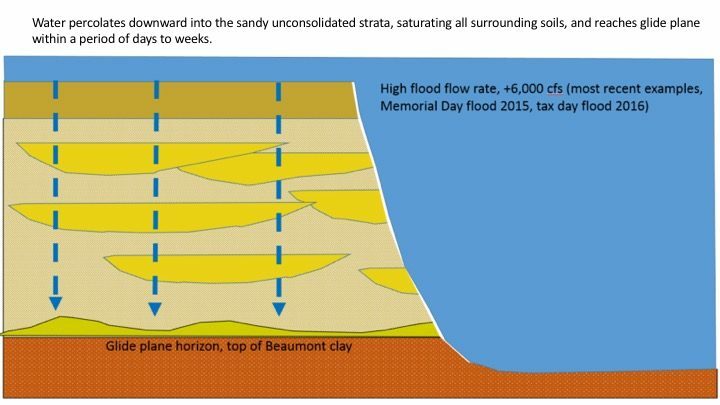 The latter incredible figure represents nearly one-third of all the estimated sediment in the entire length of the bayou from Beltway 8 to Shepherd Drive. (The Corps in its Environmental Assessment excuses these impossibly divergent estimates of erosion by arguing they were “derived using different methodologies, so they are not directly correlated.” p. 56) Note, however, that even though 359 tons a year might sound like a lot, it’s actually rather small. Geologist Bill Heins estimates that 359 tons of sediment spread inside the foul lines of a softball field in Memorial Park would cover the ground to a depth of only three-eighths of an inch. 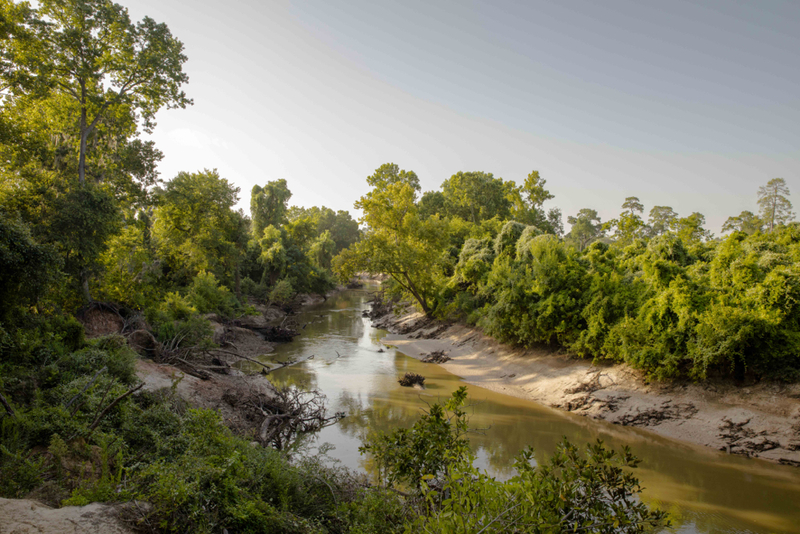 But the project itself—channelizing and shortening the stream and increasing the flow—will cause greater erosion, flooding, and sedimentation downstream, if not also within the project stretch. This is a well-established fact acknowledged by the Corps over seventy years ago (p. 18), as well as the district’s consultant (Brown and Root, 1995, cited in the permit application p. 587). See also here. We have not even mentioned the many other significant negative impacts, including the loss of wildlife habitat, the mass murder of tiny creatures in the sandy bottom and banks so vital to the health of the river ecosystem, the loss of shade, the increase in temperature in the stream, the loss of the cleansing, absorbing, filtering, and stabilizing power of the riparian trees and vegetation. And so much more. Here’s what you can do about it. 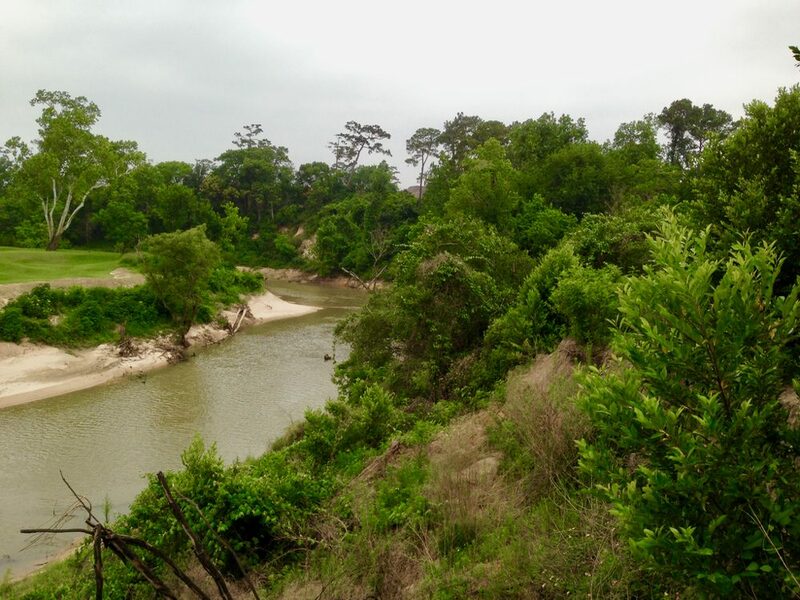 This article is based in large part on the field observations and research of geologists Bill Heins, PhD and Tom Helm, both of whom have been observing and enjoying Buffalo Bayou for many years. 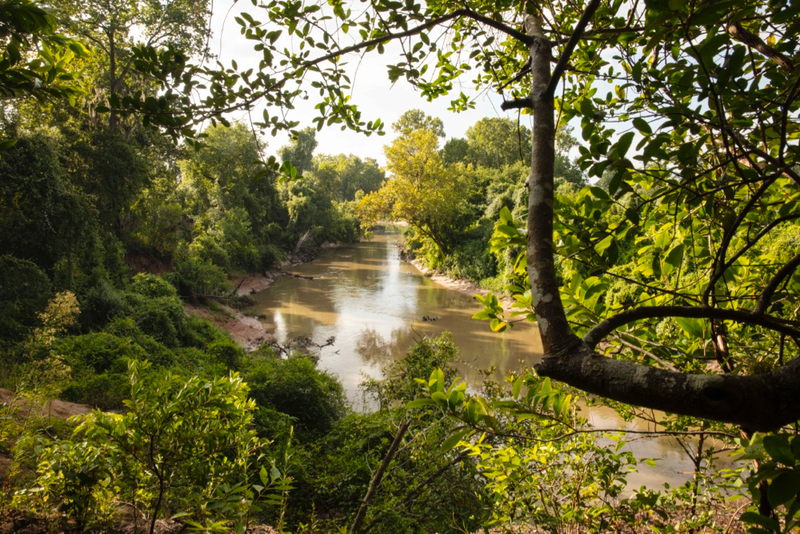 The Harris County Flood Control District’s plan for Buffalo Bayou flowing past Memorial Park. River Oaks Country Club on the bottom (south). Orange is fill, yellow is excavate.